Choose your Ardennes-Etape gift voucher here. A special gift, that allows the receiver to choose a vacation home stay, by him/herself. The gift voucher value needs to be between €5 and €2500. To whom do we have the honour? After payment reception, the gift voucher will be put at your disposal in your Ardennes-Etape account. You can then choose to print it or to send it by email. The gift voucher is valid for the general offer of available vacation homes that appear online on the website. This means, that Ardennes-Etape does not guarantee availability for a specific vacation home. The gift voucher is valid up to 1 year maximum after its release. The expiration date is indicated on the voucher. By purchasing the gift voucher you declare to have taken cognisance of the general conditions. Do you have any questions concerning the payment? Contact our contact center. In case you prefer not to pay your order immediately, you can always do this later by using your Ardennes-Etape account. Thank you for your orderArdennes-Etape has received your payment. Now, go and make someone happy with the gift certificate! 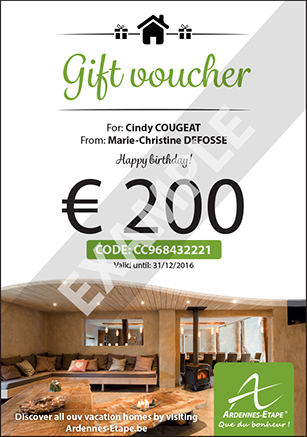 From now on, the gift certificate is also available in your "My Ardennes-Etape" account. When Ardennes-Etape receives your payment, the gift voucher becomes available on your Ardennes-Etape account. You can download the gift voucher by clicking on “Download”. We are looking forward to remaining at your service any time soon. Did you receive a gift voucher? +2,400,000 travelers since 13 years!